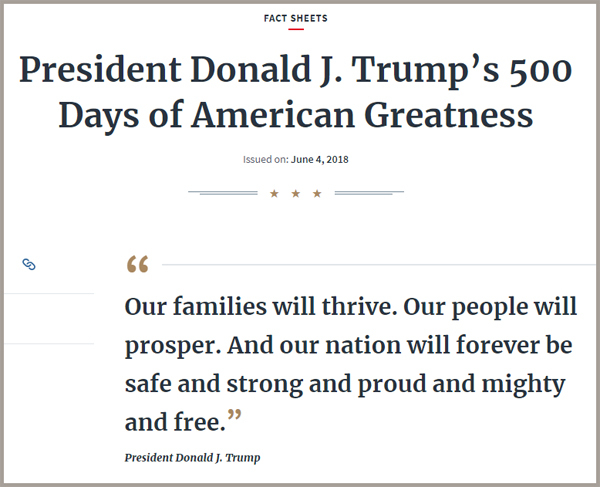 The White House has issued a "Fact Sheet" detailing all the successes [sic] of Donald Trump's first 500 days in office, and we all need to be completely blunt about what it is. It's rank authoritarian propaganda published on the White House website. That really sets the stage for what follows — which is a collection of "facts," some of which are naked lies and others of which are cherry-picked and decontextualized to the point that they might as well be naked lies. "President Trump has re-asserted American leadership on the world stage, secured vital investments in our military, and stood up against threats to our national security. President Trump has put the American people first and made government more accountable." OMG. It goes on and on like that, written by and for cultists with zero regard for the truth or anything resembling reality. The only "reality" that matters is the one they create. Despite its aggressive dishonesty, this straight-up copy+paste authoritarian dispatch will not be fact-checked prominently on every news site/channel today. It will be astonishing if it even gets a passing mention. As I said in comments earlier today: We are witnessing the demise of democracy globally, and our media isn't talking about it. Donald Trump continues to endeavor to harm us, and the press continues to fail us.